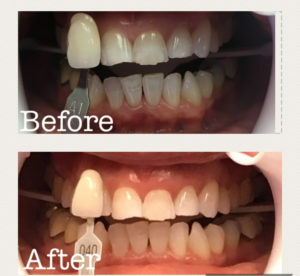 How Teeth Whitening in Benbrook Gives You a Hollywood Smile! You may have heard of teeth whitening before from local dentists, but how often did you experience teeth sensitivity after completing treatments? This common issue affects thousands of people every day, making it difficult to get necessary retouching appointments done. In fact, many patients will avoid teeth whitening entirely because of this problem, especially if they already suffer from teeth sensitivity on a daily basis. Now, you can get teeth whitening in Benbrook without the worry of sensitivity, both in-office and at home with GLO Whitening kits! GLO Whitening is a teeth whitening product that makes use of Guided Light Optics (GLO) to whiten teeth, without the worry of sensitivity. 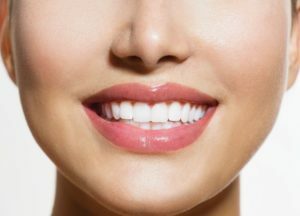 The device itself consists of a mouthpiece that is worn in 8-minute intervals, a handheld remote that connects to the mouthpiece, and a series of Whitening G-Vial Gels. To use the GLO Whitening system, simply start by applying the whitening gel directly to your teeth. Then, insert the mouthpiece into your mouth and turn on the device with the connected keypad. Once activated, the mouthpiece’s many blue lights turn on. The heat generated from GLO’s mouthpiece heats the whitening agents, allowing it to permeate through tooth enamel and reach the dentin layer. This is key because the dentin is where most stains lie, especially intrinsic stains that can’t be removed with over-the-counter whitening trays or whitening toothpastes. Through this method, you can get your smile up to five shades whiter in just five days with little to no sensitivity! Not many treatments can assure that! What Should I Expect During In-Office Treatment? 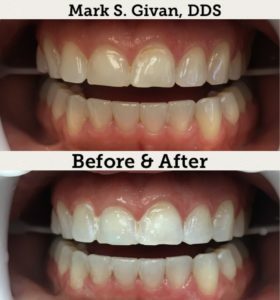 Just because GLO is often advertised as a portable whitening solution doesn’t mean you can’t get treatment completed at your local dental office! In just under an hour, a dentist can help you achieve your whitest and brightest smile. Additionally, you’ll get a powerful lighting device and whitening gel that’s only available from your dentist. If you’re looking for the quickest solution to whitening teeth, perhaps for an upcoming event, in-office whitening is the solution for you! What About Take-Home GLO Whitening? GLO Whitening is not only usable while at home or on the go, but it’s incredibly convenient thanks to the strap connected to the device itself. By popping in the mouthpiece and wearing the device around your neck, you can experience the power of GLO Whitening hands-free! Of course, you can easily combine both in-office and take-home whitening options as well. After you’ve gotten a full treatment in-office, the take-home version can be used to touch-up your smile conveniently and easily, with little to no sensitivity that often comes with traditional whitening treatments. Don’t wait to get the smile you typically only see in action films and romantic comedies. Schedule an appointment with a cosmetic dentist in Benbrook today to learn more and get started! Dr. Mark S. Givan earned his dental degree from the Baylor College of Dentistry. To stay updated on the latest advancements in cosmetic dentistry, he takes 20 to 40 hours of continuing education every year. To learn more about his cosmetic treatments or practice, contact him through his website. 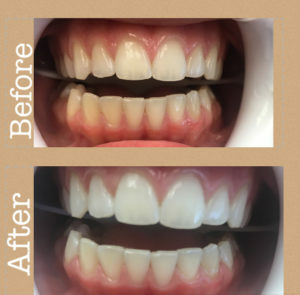 Comments Off on How Teeth Whitening in Benbrook Gives You a Hollywood Smile!